Almost four years ago now, the Yankees made a mockery of baseball’s international amateur talent acquisition system when they blew their bonus pool out of the water and signed basically every highly regarded prospect during the 2014-15 international signing period. They spent roughly $30M on prospects in one day. Other teams soon followed suit and MLB had to change the rules. The 2014-15 spending spree has not worked out as hoped. Much of the big name talent has stalled out, with lower profile signings like Estevan Florial ($200,000) and Freicer Perez ($10,000) emerging as the cream of the crop. The Yankees have a great Latin America scouting system and they consistently find low-cost gems like Florial and Perez. Luis Severino ($225,000) and Jorge Mateo ($250,000) were also small bonus guys back in the day. The 2017-18 signing period doesn’t end until June 25th, but already the next great low-cost Yankees prospect is generating buzz. Dominican infielder Ezequiel Duran, who signed for $10,000 last July, is earning high praise early in his pro career. Kiley McDaniel ranked Duran as the No. 14 (!) prospect in the farm system last month, and earlier this week, the great Ben Badler (subs. req’d) wrote him up as a sleeper prospect. Duran was a mid-six-figure prospect whom the Yankees scooped up last year for $10,000 because he failed to register with MLB and fell off the radar of many teams as they quickly spent their bonus pools. He just got to America for the first time this (March), so some Yankees staff members aren’t even that familiar with him. Nevertheless, he’s made some noise in March, including hitting an opposite-field homer at 109 mph in a spring training game. He’s posted some exit velos up to 112 mph in the Dominican and projects for above-average to plus game power, as his feel for hitting is also advanced.
? Duran profiles as a bat-first second baseman, and given his age and last year’s DSL performance, as well as the fact he’s already in Tampa, it’s safe to assume he’ll spend the summer with one of the Yankees’ three rookie ball affiliates. Either the Pulaski Yankees or one of the two Gulf Coast League teams. There’s no reason to take it slow here. Duran’s bat is advanced and he’s already 18, so let’s get the show on the road. Now, it’s important to keep things in perspective. This is an 18-year-old with 15 pro games under his best, none of which were played in the United States. It’s great he looked good in Spring Training. But it is only Spring Training, and the kid has only played in the lowest levels of professional baseball. Duran has a very, very, very long way to go before being any kind of factor for the Yankees. So much can go wrong in the coming years. That’s baseball. That said, when an international prospect gets this much attention this quickly, he’s usually a top prospect. Gary Sanchez or Vlad Guerrero Jr., someone like that. Not a kid who signed for $10,000 at 18. (Most worthwhile international prospects sign at 16.) McDaniel and especially Badler are two of the best on the international baseball beat. It’s not one random dude praising Duran. The heavy hitters are in on him. The hype machine is fired up. 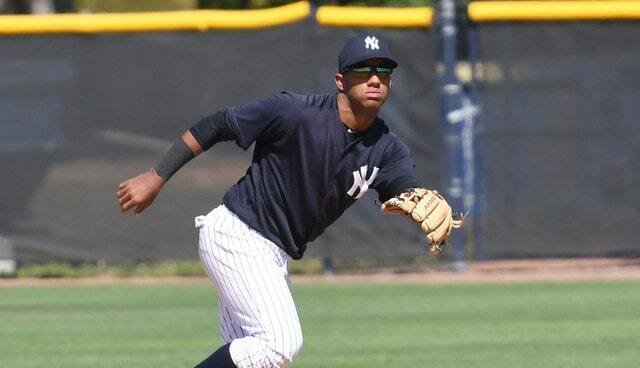 Even with the obvious caveats that apply to an 18-year-old who has played only 15 pro games, Duran is suddenly a prospect to watch this season because the early reports from reliable reporters are glowing, and because the Yankees have a very good track record in Latin America. Maybe Duran works out, maybe he doesn’t. Generally speaking though, players who get this much attention this early in their careers tend to become highly regarded prospects down the road, and that bodes well for Duran and the Yankees.